Your art history lessons don't always need to be about art. Sometimes the best way to approach a new idea or a difficult concept is to lead a discussion highlighting how different artists approached the same idea. When exploring the idea of community, and discussing the various aspects of "community" with kids, looking at art together can be tremendously helpful. The idea of a community is tricky to explain, and it's an especially abstract idea for young kids. We teach them not to talk to strangers when they're young, but as they grow older and they become aware of the concept of a community, they learn that they are surrounded by strangers who make up a very specific group... a group they are a part of (in a weird, and kind of fuzzy way). Communities are also difficult to define because they are always changing. Depending on where in the world, and at what point in history you're studying, communities may include or exclude certain groups of people depending on their income level, age, gender, race, or other factors. Looking at art is a great way to open up a dialogue with your kids as you explore these ideas together. If you are new to the practice of doing picture studies with your kids, there are a few basic guidelines to keep in mind (although there is no right or wrong way to approach it). Ask leading questions. I like to "guide" the discussion rather than telling what I know. Inspiring curiosity is key. Ask open ended questions, and let the kids wonder. Let them think about it. When kids are allowed to explore their ideas in this way, the process of getting to a conclusion on their own results in learning that is SO much more powerful. Don't rush. Careful observation takes time. Sometimes it's even good to break up a project like this into several 10-15 minute segments, depending on your kids ages and attention spans. You want to leave them wanting more! It's better to hit pause and come back to it than to get through everything with kids who have lost interest. Make connections. If you've just read something in your literature study, or seen an example of something in real life... point it out. You may need to get the ball rolling the first few times (by asking leading questions) but eventually your kids will begin to make connections on their own. When you can connect art to something else you've done or read about, that is the kind of powerful learning that kids will remember. If you'd like a little extra help, sign up here to get a great free download you can print at home to guide you through this activity! I've included several paintings below, with a possible discussion ideas for each. Remember to let your kids discuss all THEIR ideas before you ask leading questions to get them to consider these ideas. You may think of other things to talk about, and you may find different paintings to discuss. That's great! 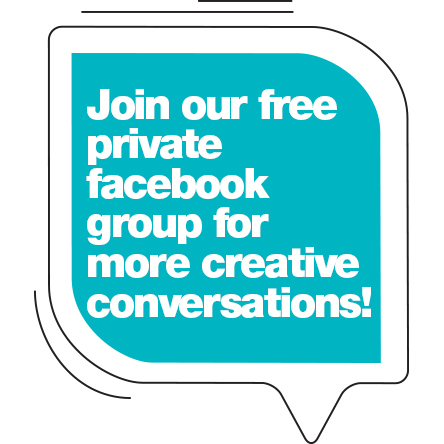 If you do, be sure to leave a comment below so we can chat about it... or better yet, join our amazing private Facebook group full of creative homeschool moms and share your brilliant ideas with everyone! The power of music, dance, and art to unify a group. People coming together to unite in a common effort. The idea that we are all connected— everyone on the whole planet, regardless of what smaller communities we may be a part of. Feeling an energetic connection to those around us. The style of clothing tells us the social standing of the people. A day in the life of society in a different era. How pets and animals fit into the community. Ideas of work and leisure in a community. The artist’s decision to stylize the people to all look the same. When are we individuals, and when do we blend into the group as a whole? The roll of the artist as a commentator on society… from the outside looking in. Communities of different sizes. Large groups and small groups. Historic traditions we might have forgotten. A look at the foods and drinks as they were in the past. How celebrations untie us as a community. The idea of your family as a community. Feeling all alone, even when you are in the midst of a city full of people. How it feels to have someones back to you. What else is hidden behind all the closed windows and doors? Public life and private life. How others see us. The reflection in the window as a symbol. The idea of “young” and how we are divided by age sometimes. To wrap up the activity, you might want to ask your kids how they define community. Ask them how they feel in different community settings (at the park, at the store, at a busy 4th of July celebration, at the grocery store, etc.). Where do they feel like they fit in? What other observations have they made about their community? As you explore big ideas with your kids through art, try to be flexible. Sometimes, a project like this will start off just as you planned, but quickly take a crazy turn and transform into a completely different kind of discussion. Embrace it! Follow your kids interests, and just make a note to yourself to try the project again later, or try to redirect it after they've finished exploring the rabbit hole. You can always come back to a project idea you've planned, but it's really hard to recapture the genuine excitement and interest when something sparks an idea in your kids. Nurture every little spark, even if it takes you (temporarily) off track. Let me know how it went! What kinds of amazing discussions did you all have with your kids? I'd love to hear about it! Get a Study Guide to go with this lesson! Sign up with your email address to receive news and updates each week, and unlock access to the AMAZING Learning Library full of fun activities, including one designed just for this topic. Thank you! Please check you email to confirm your subscription.